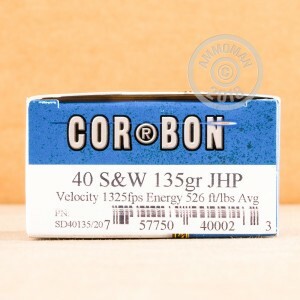 This is a high performance .40 S&W cartridge from Corbon. 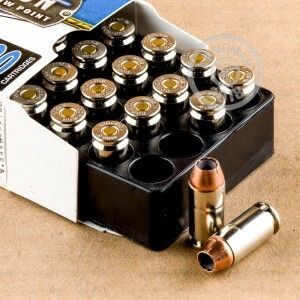 Corbon's jacketed hollow point rounds expand significantly while maintaining most of its weight. The 135 grain cartridges fire a JHP bullet at a muzzle velocity of 1,325 feet per second. JHP's are so effective due to the transfer of energy into the target. This ammo is made with a metal jacket designed for uniform and rapid expansion. This expansion creates both great shock and stopping power making it an excellent self-defense round. This round is loaded with non-corrosive Boxer primers and brass cases. Corbon is a top manufacturer of high performance ammunition for all types of shooting. All of their defense ammunition is tested vigorously so they can continue to stay ahead of the competition. You always know you're getting quality with Corbon ammo.